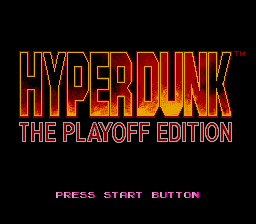 Hyper Dunk: The Playoff Edition (ハイパーダンク ザ・プレイオフエディション), released as Hyper Dunk in the PAL region and Double Dribble: The Playoff Edition in North America, is an arcade-style basketball game released by Konami for the Sega Mega Drive in 1994. It is the third console basketball game released under the Double Dribble branding in North America, following the original Double Dribble for the NES (released as Exciting Basket in Japan) and Double Dribble 5 on 5 for the Game Boy (Konamic Basket in Japan). Hyper Dunk is notable for being one of the few Mega Drive games that allows up to eight players with the use of two Team Player adapters. If the current player doesn't have the ball, cycles between players. If the current player does have the ball, passes and shoots. Main article: Hyper Dunk: The Playoff Edition/Magazine articles.